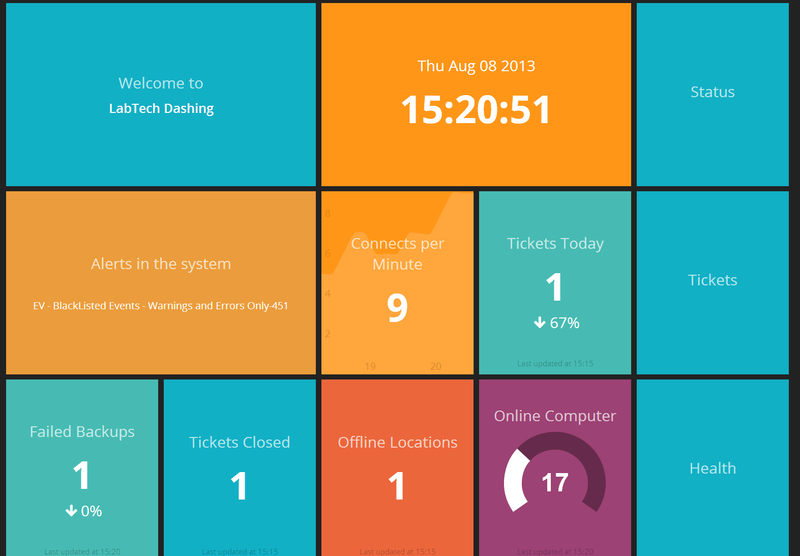 Do you want Active Dashboards? The kind that work on Big Screens, tablets and phones? You want to be able to design them yourself? You ofcourse want them protected with passwords and available directly from a web browser. 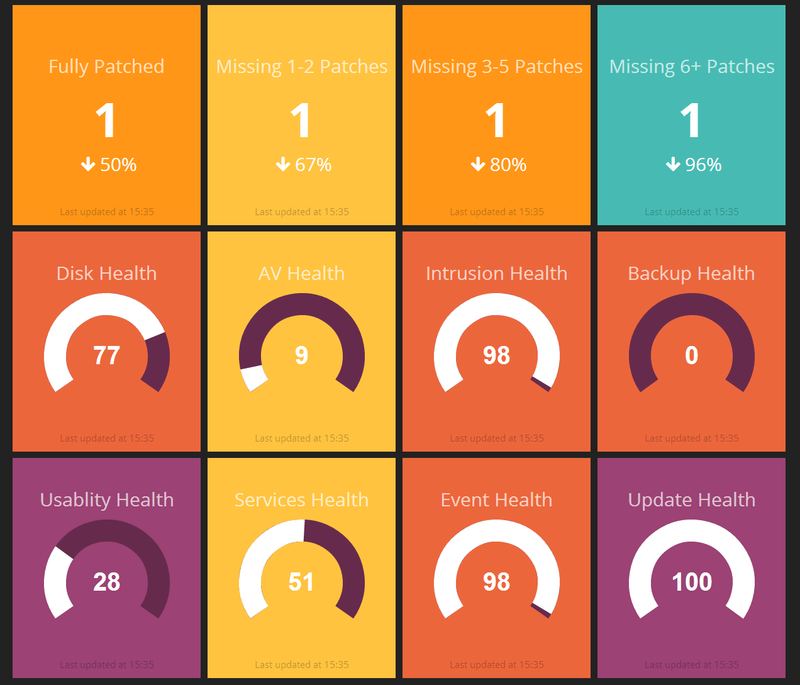 LabTech Dashing plugin provides all of this an more with slick HTML5 active dashboards integrated directly to the LabTech server. You can create multipule dashboards and each one can be secured with a unique password. If you are updating from older plugin you HAVE to follow some extra steps, as the Ruby install is changed. Stop the DBAgent, Install the Plugin, DELETE the entire RUBY193 folder, Start the DBagent. New Widgets - In the canned Widgets are examples of the new widgets and how to use them. Just add new widget, Pulldown the canned widget and click load. Check the widgets forum for explanations on the new widgets. Looks like the change below was not saved, so the column was not still saving. Fixed Removal of Plugin from Server, If you uninstall plugin in dashing server status, the folder and Tables will be deleted for easy reinstall. Added ablity to delete a widget. Love the fact that's it's in a plugin. Will be installater later to test. This is something our office has been wanting for a while. Thanks. Love the work! Can't wait to install it on our system. This takes what Martyn and I were working on to a whole new level!!! How much tweaking do you think it will require to tie this into ConnectWise and/or other tools? I have this installed and running. The 4 built in dashboards are working fine. The only immediate problem I have is cannot Save Dashboard when trying to create a new dashboard as the Save Dashboad button is greyed out. Also, if I load an existing dashboard, open a widget, apply changes, save widget, I cannot Save Dashboard. When Cancel Changes and go back into the dashboad and widget modified, obviously the changes are lost. Other than not being able to customize, this is sweet. This will be very helpful moving forward once I can modify. Thanks. Yes the Lock on the save is a problem in the port check. If the port is in use it will not let you save. This is a Bug cause if its an existing dash then it prevents the save cause the port exists. To connect to Connectwise for this would require you to manually edit the Job Files and put ODBCV code to connect to CW and execute a SQL. If you can show me real simple how to do ODBC in ruby i could add this as a Data Type. I am not sure how to do it directly via Ruby. When we were first testing with LabTech, we used PHP to query the MySQL server (first via the ODBC connection and second via a direct connection on port 3306). I don't have ConnectWise installed on-premise. I will have to get that project done before I will be of any help to you. Yeah..We(scubes13 and myself) put a lot of time into the Dashing a while back and due to scheduling/being busy/doing it on free time etc...never got MUCH traction on it going public...was very BETA at best, but this effort that Greg has put in to develop and run with scubes13's and my initial "prototype" is INSANELY FANTASTIC!!! I thank you so much for this Greg, for not only liking the dashing...but also taking the time to take it to a whole new level!! I don't think we could have come anywhere close to where you have put this and I thank you so much for doing this!! Massive Kudos to you my friend!! Massive. I updated the plugin and the Save Dashboard is working now. Thanks so much for this plugin. I can't wait to spend time creating widgets and boards. When editing the URL for the Status, Heatlh, and Tickets widgets, do we need to add anything other than the core URL to our LT Server (https://labtech.mycompany.com)? Any idea if this will integrate into AutoTask...yes, I'm one of those guys...LOL. Can we get dashing to show based on Service Plans? I would love to have a dashboard based on my Managed and No Contract. Currently it is mixing that information together. I assume that would be do-able by adjusting the SQL query and call out the MSP Contract "check box" for Managed vs. No Contract. Any chance of maybe getting a "Dashing" and "Custom Tabs" forum created where we can share our exported widgets and tabs? Also, maybe just add a sticky to those forums for download/announcements/changelogs/etc? Also, the current "Remove Widget" button will remove the widget, but when you save the Dashboard, the widgets return. Good suggestion...Leave it with me. Actually, that is a great question Alex. There is a weather widget (and others) for Dashing. Ok i am testing ODBC connectivity from the dash so you should be able to execute SQL to a CW or AT server. Also i got the weather widget in. What other widgets do you want installed by default? Based on the 'potential' popularity that this plug-in could have... it has been decided to create a separate topic (with a poll) so we can get overall view of what widgets are 'hot' and which ones are 'not' in our community. Another reason why this being done, is to separate the plugin/widget conversations so we can find things easier. Please place your votes, comments and discussions on the widgets here: http://www.labtechgeek.com/forum/viewforum.php?f=20. Please use THIS board (the one you are on right now) for discussions of the plugin itself. I am having a small issue here. We were getting a flood of emails from AT about excessive API requests. We are allowed 10,000 per 60 minutes. After a couple of days of disabling/enabling plugins I now see that the dashing plugin "appearing" to be my main cause at this moment. are you sure it's the dashing plugin? i'm not sure if that's possible? i don't think the dashing plugin does any AT web api calls. Only time AT api calls are made is when tickets, notes, times, or comments are added or when PC/network device (configuration items in AT) sync. I don't think the dashing plugin makes any changes , it just reads data of the LT database. I just looked at my AT plugin and i have nothing out of the ordinary documented in the API calls area since installing the dashing plugin. I could be missing something though. What leads you to believe its this plugin? That is the only thing I can assume at this moment. There was a MASSIVE API call to AT starting on the 21st of this month. Now there was two things that changed for us on our LT server. Mike's Nitnite Plugin was updated and we installed Dashing. We disabled the Ninite plugin as we knew it posted to AT. We let is sit for 24 hours, and still seen a massive growing API request to AT. Now that we have have the dashing disabled it has dropped in half yesterday, and today is back to normal. I have attached the screen shoot of my AT Plugin. You will see yesterday it dropped in half. Today is higher, as I was turning dashing and Ninite back on and off, trying to watch traffic from the server. If my hunch is correct, tomorrow the API will be back to normal. I will say this, I am not blaming either solution for this issue. I am under pressure from AT to get it resolved, as it is putting a load against their server(s). I guess the picture is to big to view here. I will attach the full image here. we have 1500 agents, ignite, mp's ninite solution, dashing, etc enabled. we are only in the 9000-13000 range for API calls. we do not use the sensor and some of the ignite perf monitors though.